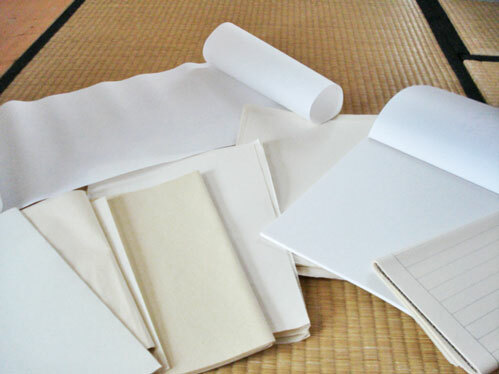 We can find various types of Kara-kami papers and Washi papers. the main raw materials are straw, bamboo, mulberry..
and the characteristics are thin and its ink blurring abilities. Ink absorption is quite high. made in Japan, one of the Washi types. the main raw materials are gum-pi tree, hemp, mulberry, rice straw..
the characteristics are thick and its less ink blurring abilities. The ink absorption is less high than Chinese Xuan paper. The essence of ink colour appears directly on paper. < Previous What is Shodo? !